Socks are boring. Everyone knows this. Even novelty socks with pictures of Homer Simpson in a Santa suit are, actually, boring. Look at the American sport man-rounders for confirmation if you don’t believe us: the Boston Red Sox have had to use an X (the coolest letter or the alphabet) to avoid sounding less interesting than the Edinburgh Woollen Mill. SOC is therefore an odd moniker for Gigabyte’s massively overclocked Radeon HD 5870 graphics card, or at least it is until you realise that SOC stands for Super Over Clock – the kind of overclock that DC and Marvel would be proud of. 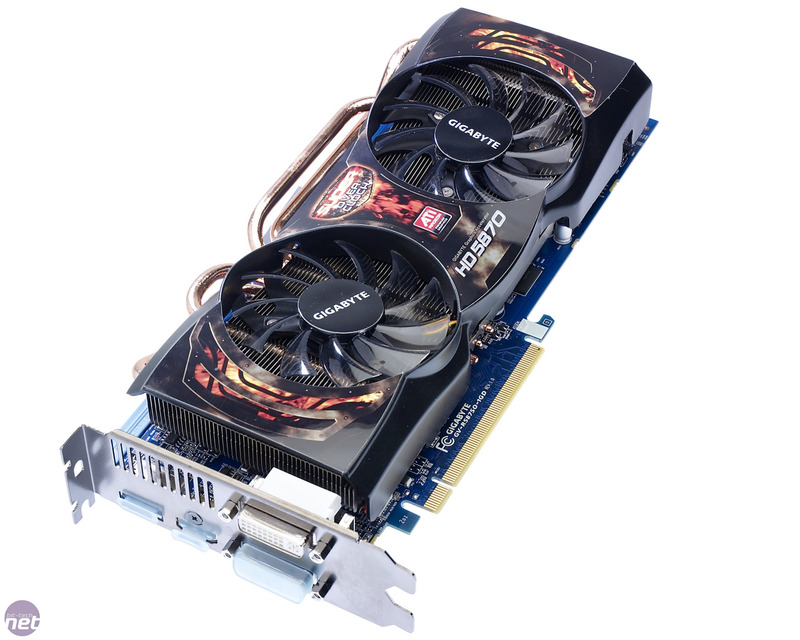 This overclock takes the form of a 100MHz boost to the GPU frequency and memory, taking the former from 850MHz to 950MHz and the latter from an effective frequency of 4.8GHz to 5GHz. While that might initially sound as if the ‘Super’ of the name is more Enid Blyton than Clark Kent, remember that these are the stock speeds of this card, and that other pre-overclocked HD 5870 cards haven’t overclocked as far, even after we’ve had a bash at them. While some of the specs might look identical to those of any other HD 5870 – there’s 1GB of GDDR5 memory, the usual comprehensive array of display outputs and a pair of CrossFire connectors – the SOC is as unique as graphics cards come these days. 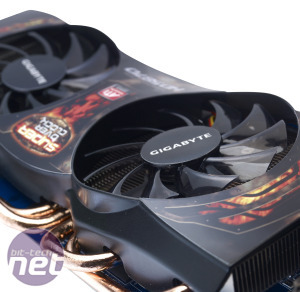 For a start there’s Gigabyte’s custom cooler, which uses two 92mm fans to blow onto two large heatsinks. These are fed by the four copper heatpipes that you can see snaking around the side of the card. 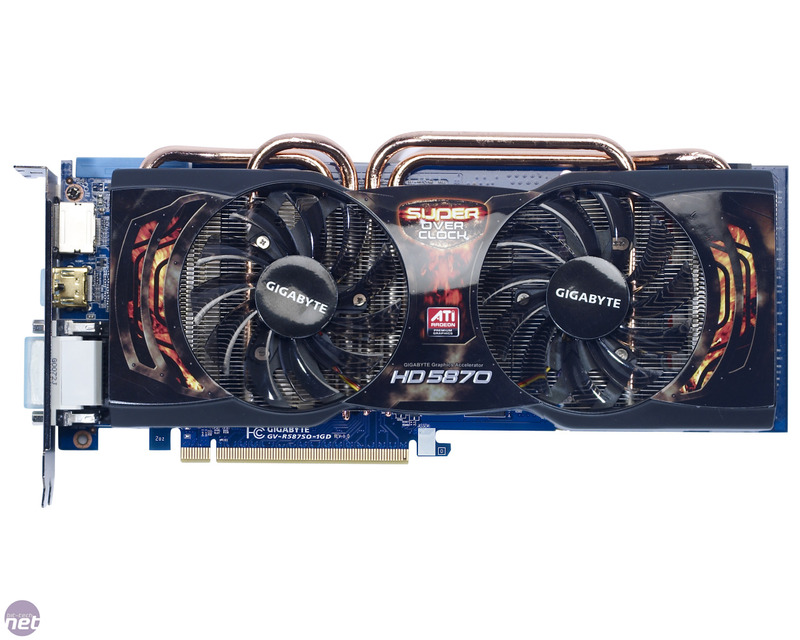 Under the cooler is some of the most robust power hardware you can squeeze onto a 10.5in-long graphics card’s PCB. There’s a 6+1-phase power circuit for the GPU itself which uses digital MOSFETs, solid chokes and 13 capacitors to smooth the power, plus an equally robust single-phase power circuit for the memory. 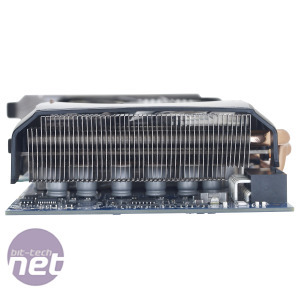 It’s really easy to whip the cooler off as well, as it’s only attached by four spring-loaded screws – this is useful if you’re taking the card to some kind of extreme overclocking competition, where the voltage readout points at the end of the card might come in useful. The row of LEDs on the back of the card might also be of use, as they show the level of power load that the card is under. 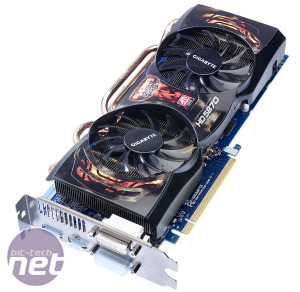 The card still only requires a pair of 6-pin power connections though, rather than the beefier 8-pin connector of a GTX 480 or a HD 5970. 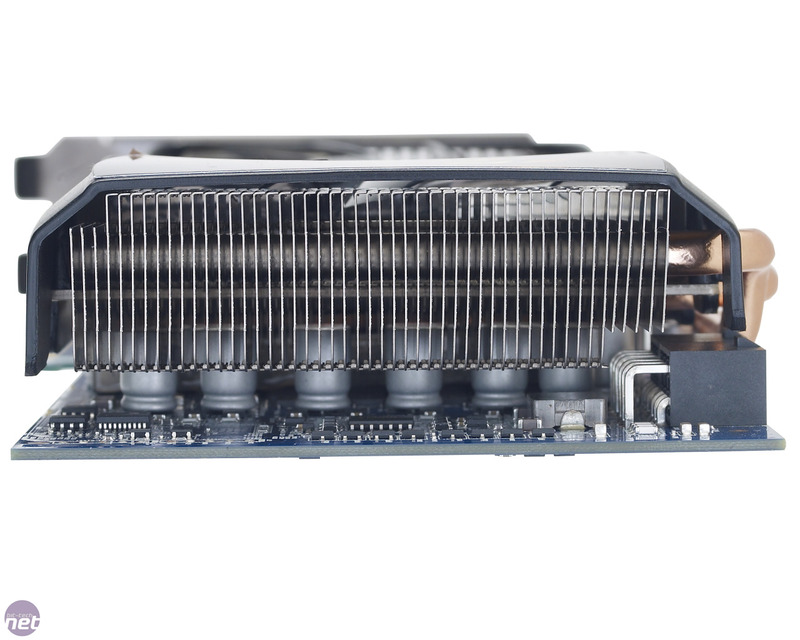 The cooler itself is a chunky heatsink that directly cools only the GPU. Four 6mm-thick heatpipes take heat from the GPU to the large heatsink that stretches from one end of the card to the other. Two 92mm fans blow down onto the heatsinks, and thus the VRMs and memory, but otherwise both of these essential subsystems have no cooling. 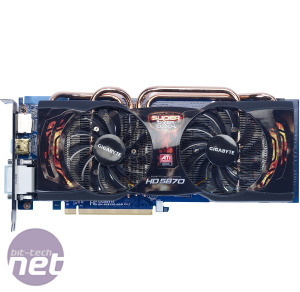 A press picture of AMD's Radeon HD 6870 has leaked ahead of the card's official launch. 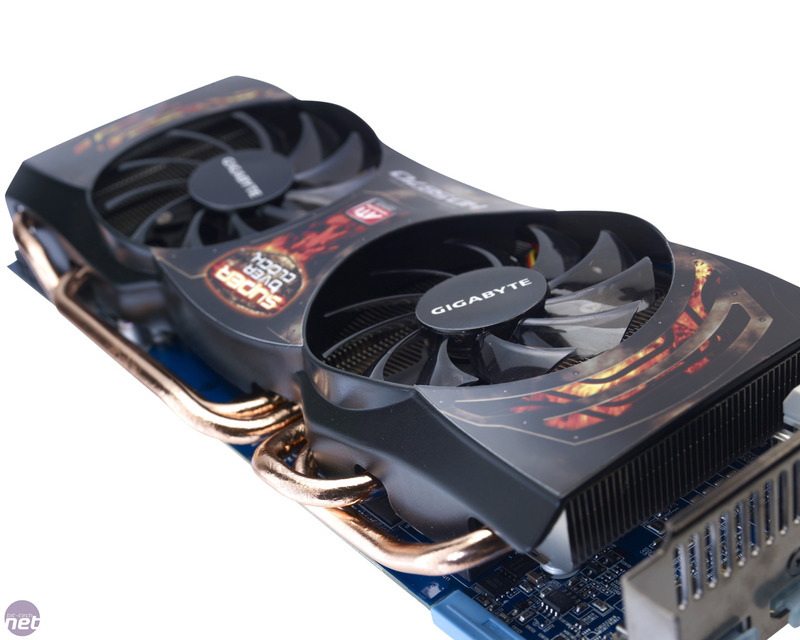 We show you how to get the best from your graphics card with our simple guide.